Over the past 18 months, Governor Wolf has achieved significant progress to move Pennsylvania forward. Working with a Republican dominated legislature, Governor Wolf has secured over half a billion dollars in new money for schools along with a fair funding formula that will help school districts that need it the most. He has also won reforms that have languished for decades like modernizing the sale of beer and wine, the legalization of Medical Marijuana, and the phase out of the capital stock and franchise tax. In just under two years, and with a sometimes adversarial legislative body, it is clear that Governor Wolf has secured significant victories and is making progress to move Pennsylvania forward. When Governor Wolf took office, he inherited a commonwealth moving backwards as a result of bad policies, misguided decision-making and budgets built on gimmicks and smoke and mirrors. Schools were suffering from devastating cuts that resulted in larger class sizes, mass layoffs of educators, and cuts to important programs. The commonwealth was 1 of 3 states that did not have a fair funding formula. Medicaid expansion was an unbridled maze of bureaucratic red tape. Pennsylvania’s heroin crisis had grown to represent our biggest public health crisis in our lifetime. Liquor reform had languished for decades. Citizen’s legitimate environmental concerns had been neglected. Our deficit had grown to more than $2 billion. Governor Wolf has fought hard to turn things around and worked with the legislature to move the commonwealth forward, and in less than two years, he has made significant progress. The new basic education funding included in the 2016-17 budget will be distributed using the fair funding formula, signed into law by Governor Wolf in early June. Prior to the passing of this bill, Pennsylvania was one of only three states that did not have such a formula in place, creating massive inequities in schools and hitting the most vulnerable students the hardest. The 2016-17 budget is an important step forward and includes sustainable, recurring revenue that makes significant progress toward reducing our structural deficit. When Governor Wolf took office, he inherited a deficit of more than $2 billion, and while we have more work to do, today, the commonwealth’s deficit has been significantly reduced. 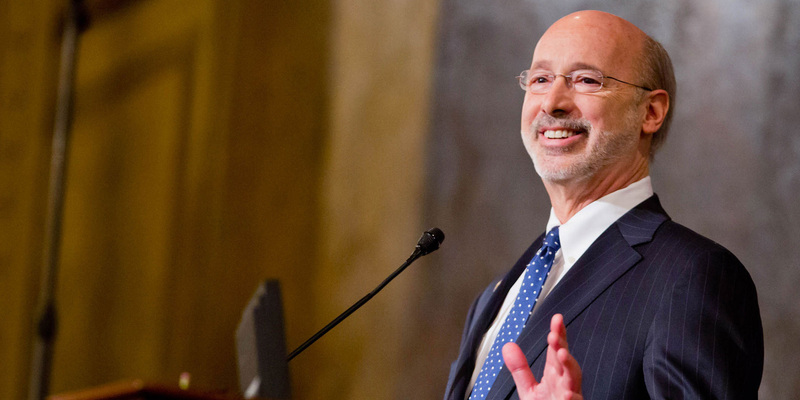 In February of 2015, Governor Wolf launched Pennsylvania’s transition to a simple, traditional Medicaid expansion plan. He simplified what had been unnecessarily made into a complicated process, and by doing so ensured hundreds of thousands of Pennsylvanians now have greater access to the health insurance they need. Today, as a result, of Governor Wolf’s leadership, more than 650,000 Pennsylvanians now have health insurance who did not before. Governor Wolf also worked to ensure that Children’s Health Insurance Plans program provides enhanced benefits so no family would have to worry about paying federal tax penalties or losing their insurance. Governor Wolf has made the fight against the opioid abuse and heroin use crisis a top priority. He has traveled around the state to meet with state lawmakers, local officials, law enforcement, emergency personnel, health professionals and others, and everywhere he went, he heard about the need for more treatment. In the 2016-17 budget, Governor Wolf worked with the legislature to secure $20.4 million in the budget to combat Pennsylvania’s heroin crisis and expand treatment options for Pennsylvanians struggling with opioid use disorder. This critical funding will enable the Department of Human Services, during phase one, to implement 20 Opioid Use Disorder (OUD) Centers of Excellence that will treat approximately 4,500 people that currently are not able to access treatment. In May, Governor Wolf urged the Liquor Control Board to “free the six-pack” and approve all applications from gas stations looking to sell six packs. And in June, Governor Wolf signed historic liquor reform into law, marking the most significant step the commonwealth has taken to reform our liquor system in 80 years. Liquor reform was bottled up in Harrisburg for years, and as the governor made clear, his goal was to modernize the sale of liquor and beer in Pennsylvania. These important achievements finally bring Pennsylvania’s beer, wine and spirits system into the 21st century. In April, Governor Wolf signed into law the legalization of medical marijuana, a measure that was long overdue and had stalled in Harrisburg for years. The legalization of medical marijuana improves the quality of life for patients and their families throughout Pennsylvania. Governor Wolf spent much of his first year-and-a-half in office meeting with patients, families, and advocates, holding roundtables with medical professionals, and urging the legislature to send this important legislation to his desk. Governor Wolf has worked to make government more open and transparent to the people of Pennsylvania. On his first day in office, the governor signed executive orders banning gifts for executive branch employees and reforming legal contracting to ensure any contracts are awarded through a competitive process. Additionally, the governor has posted cabinet expenses and his daily schedule and weekly calendar online. The previous administration had to be sued before giving out the governor’s calendar. Governor Wolf fought to pass tough unconventional oil and gas regulations, which will better protect the health of our environment and our residents. These new safeguards improve the protection of water and public resources, as well as public health and safety, and also address landowner concerns, enhance transparency, and improve data management. Earlier this year, Governor Wolf announced a nation-leading strategy to reduce emissions of methane. With federal estimates that the natural gas and oil industries account for a quarter of U.S. methane emissions, reducing methane leaks from the oil and gas sector is one of the essential steps needed for government to work with industry to reduce global greenhouse gas emissions and reduce the impacts of climate change. In early 2016, Governor Tom Wolf announced the successful January 1 phase-out of Pennsylvania’s Capital Stock and Foreign Franchise tax, calling it “an unfair tax on business” that he was committed to eliminating. The Capital Stock and Foreign Franchise tax dates to 1844. Its phase-out that had been scheduled by Governor Tom Ridge for elimination in 2008 was delayed by subsequent administrations. In June, Governor Wolf was notified by Shell that they would build their ethane cracker plant in Pennsylvania. The administration has worked to develop strategies for safe and responsible pipeline development that brings resources to markets and facilities and we have prioritized the Shell plant to show the world that Pennsylvania is a leader in energy manufacturing and downstream production. In order to achieve these goals, Governor Wolf worked diligently with Democrats and Republicans in both the house and senate to find common ground and he made significant compromises. We have made great progress in just 18 months. We have more work to do and Governor Wolf knows that, and he look forward to continuing to make Pennsylvania even stronger.